I never win anything. I don't play the lottery and I usually don't put my name in the blog giveaways. But when Nancy from Near Philadelphia announced a giveaway commemorating her 1000 post, I did leave a comment. And she picked me to get some "reenuzit" charm squares. I am going to add them to some of my leftovers and create a north/south schnibble! Busy day today. I went over to see sweet Alice. She is crawling now and will be soon walking. Tyler manned the grill and made yummy burgers. I miss grilled burgers but not enough to get a grill! Also stopped at Petsmart and picked up a Furminator as I am finding more and more gray fur on the floors. Thanks to Gretch, Willie is quite the sleek by tonight. I will finish Scrappy Nines tomorrow. Stay tuned for photo after Thimbles. Cindi and I made a trip out to Sweet Home ..just because. I picked up a backing for it. Bummer the weekend is half over. 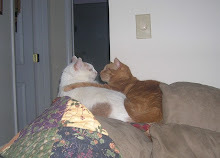 It is really too hot to be outside, so tomorrow will be a relaxing indoor day. Wild Willie logging some computer time..
Wild Willie checking up on the boys up North-Smudge and Lester. 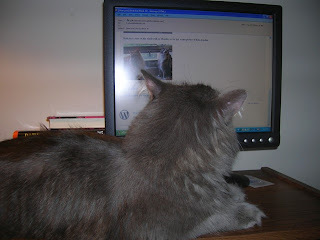 He also needed to check in on the local felines Stella Bella and her posse. He was very sympathetic and sent a get well quick note off to Morph after his visit to the vet today. I, on the other hand, had couch time finishing up a book. Maybe since I managed to stay awake this evening I will sleep past four thirty tomorrow morning. (But I am not counting on it). I did some work on Scrappy Nines. I am not going to take a picture of it until after Pat sees it in person at the next Thimbles. 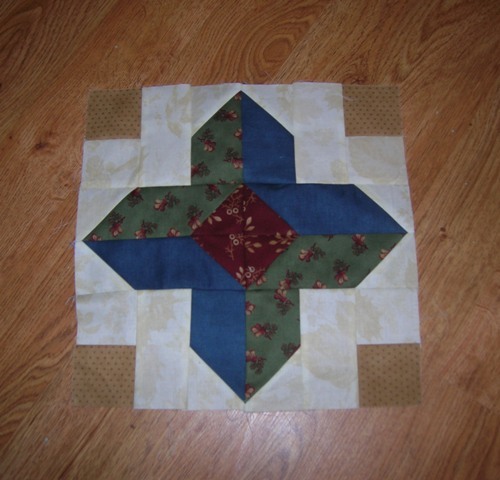 I have got the main part of the top just about done and sewed together. I still have to do the outside rows. Visit to the doctor this afternoon now that I have my new insurance card. Blood pressure was really good and now I have 3 months of drugs to keep it that way. It is a wonder my pressure was as good as it was considering I was in her office for almost an hour and a half. (Just to get that lousy prescription!) I rewarded myself by stopping at Starbucks on the way home!! Gretch told me about this picture. I had to get the magazine-just for this! 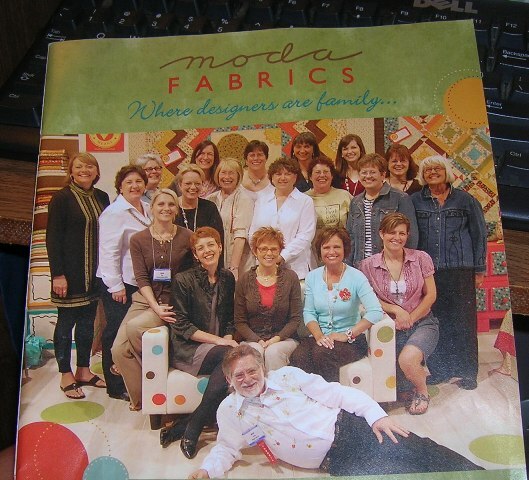 So there he is-Moda Man..okay the real Moda Man with some of the designers. with his girls. Eat your heart out, Mark. Bolt even wanted to hang out with the ladies! Better get back to the construction of those nine million zillion and one nine patches! block 11 of the Moose on the Porch series finished! I really like this block. Also have worked on the 9 patch segments. I think I have made all the light-dark-light segments. On to the dark-light-dark segments. I have to figure how many million of these I have to make! 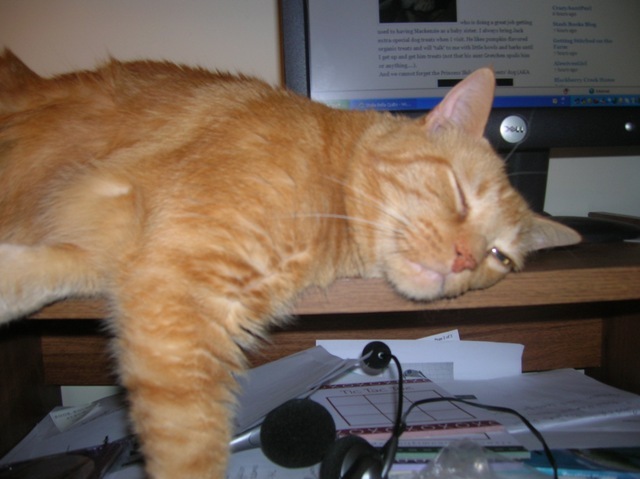 After Sarah and Emma went home, I thought I could get more done but I really was a little bit tired. I did finish Figgy Pudding. 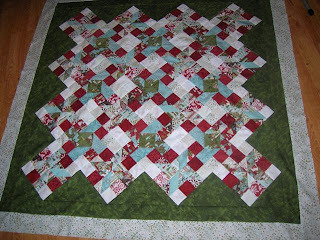 I had some yardage of the line and decided to use the light background one for my border. Hope Kris likes it. I will use one of the stripes from the line for the border. Another project almost completed. Then I ended up on the couch for a little nap-there went the afternoon...and now it is back to work. (I did manage to get 36 nine patches done). Part 2 of Thimbles weekend. I continued working on nine patches for Scrappy Nines. 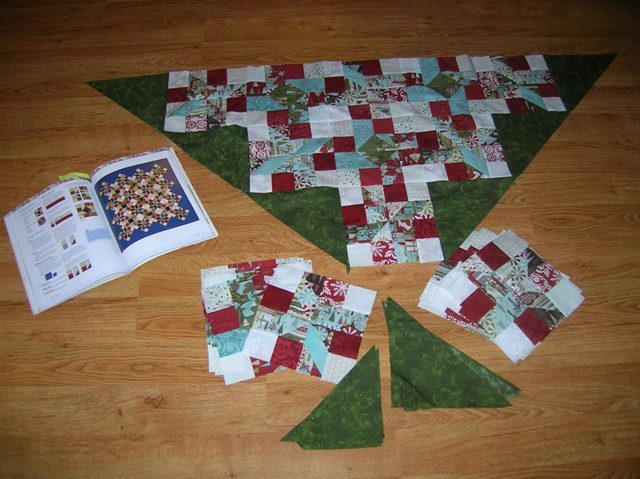 I have 12 blocks done. Only 8 million 56 thousand more to go! It took me 2 trips to put all my stuff back in the car to bring it home. mountains of one and a half inch strips! This coming week is the stitch in. unfortunately, I do need to work. But I did decide to go next Saturday. Sarah and Emma came for a sleepover. Sue told me they would probably go to sleep early as they had been swimming all morning. Hah-like that happened. I went to bed at midnight and Sarah was still awake. We varied our picnic routine slightly. We had a variety. Chick filet and McDonalds. They are at opposite ends of the parking lot. Willie loves the routine because he always get fries with his kibble. Emma spotted Moda Man in my sewing stuff and wanted to know if he was Jesus. Must have been the beard not the bling. At any rate, Moda Man, Bolt and the kittens were being entertained by the Polly Pocket crew. I am not quite sure where he is right now. Probably needed to find a quiet place to sleep! The living room is like an obstacle course at the moment. The girls are passed out on the couch. I seem to have slipped back into that old sleep pattern. Awake at 4AM. What is that all about?? This is a Thimbles weekend and after having a pretty crappy couple of days at work, I decided I needed at double dose. Then I headed over to Grayson stopping at Brewster's. I told Pat I am on the Brewster's diet this week. Cold and chocolate. If is is not that, I don't want it!! 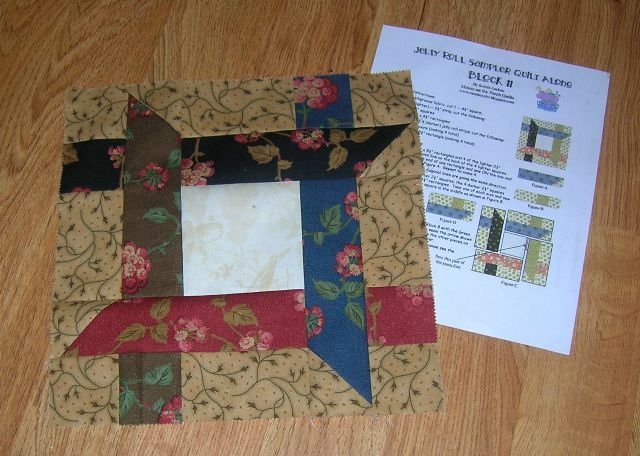 I am now working on Scrappy Nines a Pat Wys pattern and I am doing it scrappy scrappy. 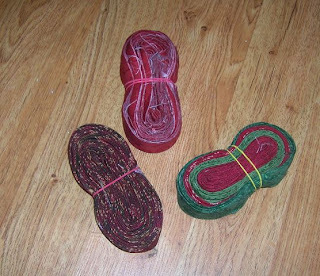 I dragged 2 piles of misc little leftovers and spent the evening making 1 1/2 inch strips. 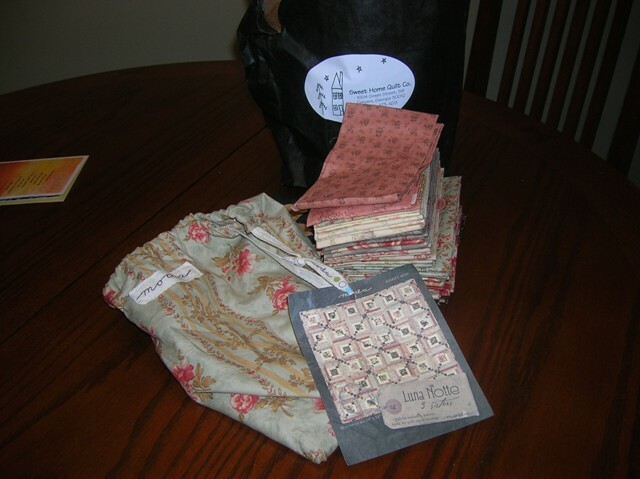 When I go back today I will make some nine patches. I think I need eighty gazillion.! Biggest problem will be dragging all this stuff home again this afternoon. Now I am going to make some coffee. Might as well be productive since I am up and awake. We all seem to be in slo mo here. I had great plans for the week....just didn't happen. I did read a fluff book though. Janet Evanovich-Stephanie Plum book. she cracks me up. Henry is patiently waiting for me to find a more comfortable spot for him. I replaced the batteries in the camera today so Now I am good to go. 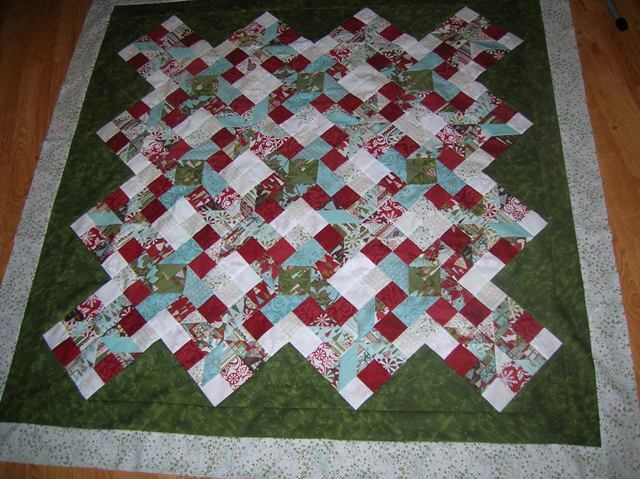 This is the quilt top I worked on yesterday out at Sweet Home. The fabric is Figgy Pudding-Basic Grey's last year line and the pattern is from the second book by the Lintott ladies from across the pond. 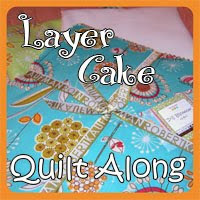 ("Layer Cake, Jelly Roll and Charm Quilts" is the name of the book). Their next book is due soon. 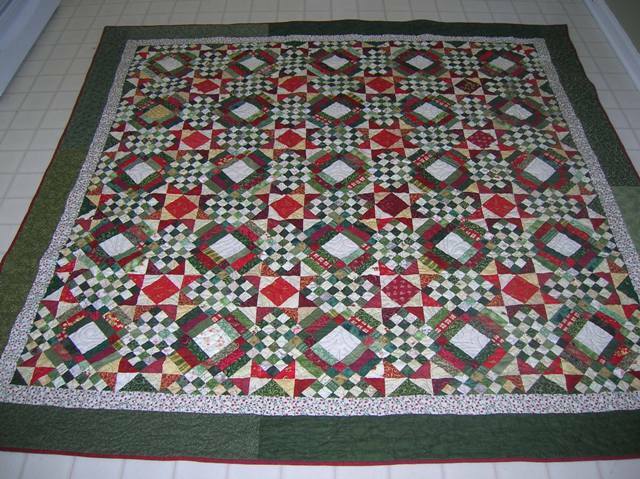 Sarah picked out the green fabbie to go with this wonderful piece of fab that I HAD to have. I am glad she picked it out, even though it won' t be used like I had anticipated. This morning I spent some time looking for a piece of fabric that I bought for a backing last year. It is missing. Haven't a clue what I did with it or where it is! Oh well-I guess I will need to go shopping!!!! Today was the day we were planning to sew out at Sweet Home. A time to be with other Thimbles between our "official" time together. Kristie and Becky were unable to come and we did miss them. 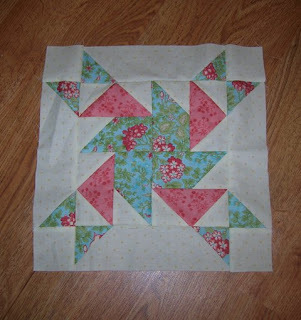 But now we have the opportunity to schedule another time to sew. Melisa had her bears all over the shop and there was a photo op. Moda Man had his picture taken with the bear. Unfortunately, my batteries died-so no pictures. Hopefully I will be able to see the one that Melisa took. She had give aways and prizes and lots of good stuff all over the place. Of course while we were upstairs sewing, we needed to take a field trip or two downstairs to shop. Gretchen worked on a wonderful little Schnibbles project and finished it up. Cindi was putting borders on brother's quilt. 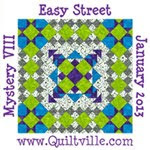 I worked on the quilt I am making for Kris from last year's Figgy Pudding line. I made good progress. Sarah came to visit and helped me to spend some money. (Like I need help at Melisa's)! The time flew by-but the good thing is next weekend is a Thimbles weekend. 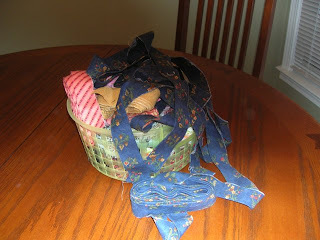 Lots of time for sewing, laughing and being with good friend! Thank you Melisa-you are the best!! Carolina Crossing finally finished. Can't remember when I started it. 80 gazillion teeny, tiny squares...Bonnie would have it no other way! 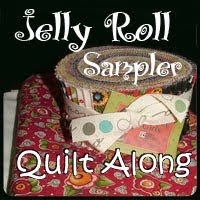 I have to figure out what this quilt completion number is for this year. I have been lax on completing projects. 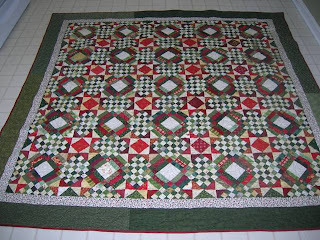 Quilt Room BOM done for July! Moose on the Porch block done! 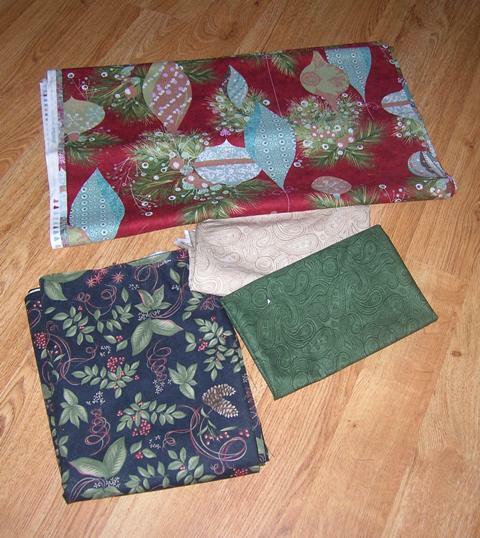 Bindings for 3 quilts: FQ BOM out of the Glace, Cheetos quilt and multicolored (red, green) for Carolina Christmas. looky what I got yesterday at the Temptress place. I definitely did not need this. BUT it was soo pretty and the only one she had. (So she said). 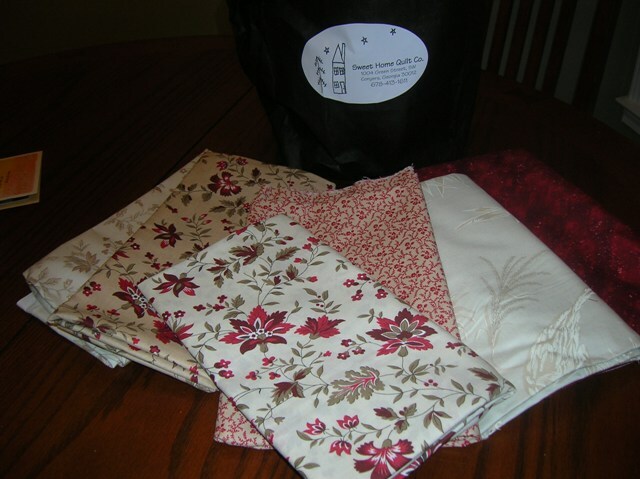 It is a pretty little Moda packet of Luna Notte with a pattern. And I HAD to have some of this French General stuff I am thinking a lovely Christmas quilt with no green cause I have enough red and green Christmas type quilts. Do you make too much binding? I am always afraid I won't have enough but always end up with extra. What do you do? For the first time I went into my basket o' binding and found 2 batches nearly the same color. I sewed them together and now I have binding for Carolina Crossing. 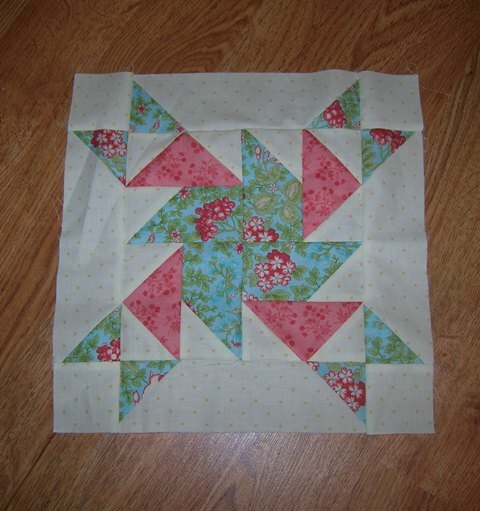 Now it just needs the hand sewing to be done! So I have made it another day closer to the weekend..yippe skippy. I think I'll go bind some.